Dusted off the 8” whiggley mold I made last year and got to pouring. They action tested very well. Awesome darting/ swimming action- perfect swim on the burn. Very excited to fish with these this season finally. Making some cape cod colors- don’t have much time to tinker too much these days but I’m slowly building up my arsenal for the season. Enjoy. Those look totally perfect, great job. I'm guessing color won't matter unless it's really really tough. I did really well up there with light orange for some reason..? Left some with a guide and, as I recall he called and told me it's all he could get to work when some smaller squid showed up. He'd used 'em hookless to "tease" fish into fly rod casting range and his client had just boated a new world record flyrod line class striper. Your old buddies will be begging you for some and you'll likely gain a bunch of new buddies when strangers see them operate! Our local squid can be an orange/beige color when they’re not fired up. I’ve run out of orange dye unfortunately- I’ve always had luck on the ol’ Dahlberg orange pearl, myself. Usually pour that color for my 10” eel bait. A popular color here is “amber” too. That micro squid bite you speak of happens sometime in June in my neck of the woods- the issue is finding baits small enough but cast far enough. We’re talking squid that are only 1-2” in total length. It’s a challenge when they’re keyed on those the only thing that seems to work for me consistently during that bite is a 5/8oz jumpin minnow in bone white- o replace the trebles with inline singles and go to work. Might even go see if I can sniff out some of the monster holdover stripers that winter in the estuaries. If I have time. I forgot to mention- during that bite I buy 3” bulb squid bodies too- run a wire through them and just fill it halfway w alumifoam and let it expand- then I attach a barrel swivel and put a stinger hook that i crimp on- it’s basically a bone white floating bulb squid that I let drift through the rips...casting it is terrible- but when you can send it far enough and just let it float the rips with an open bail it absolutely destroys- give it a twitch now and then to make it “jet” if I had more time I’d try to increase casting distance and still have it float but haven’t crossed that bridge yet. 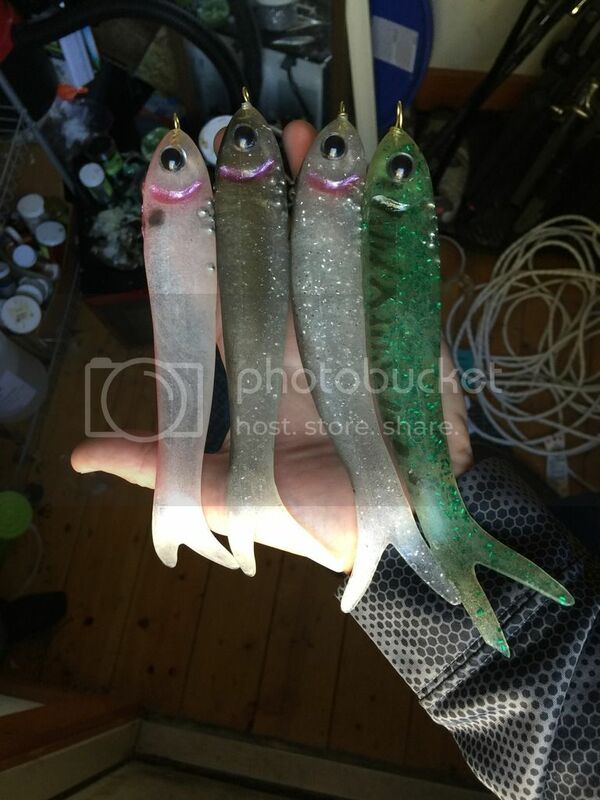 Rumor has it I may have designed a “tube jig” style insert for the bulb squid bodies that allows 4” and 9” bulb squid bodies glide and dive... in the 3-5oz range wanted to make something that would get past the schoolies and down to the big boys that hang out below them. .... but that’s just a rumor .